After leaving "Hartford" (staging, actually in Middletown behind the backdrop) and heading south through Wethersfield, Rocky Hill, Dividend & Cromwell, The Valley Local finally reaches Middletown - epicenter of railroading in the Connecticut River Valley. Two mainlines cross here (well, they're both branchlines, but you get the idea): the Air Line comes up from New Haven and crosses the Valley Line at grade before heading over the Connecticut River to Portland & Colchester. In earlier days, it went all the way to Boston and - appropriate for the season - was the route of the famous Ghost Train, an all-whitewashed limited passenger train between New York and Boston that ran for only a few years in the 1890s. 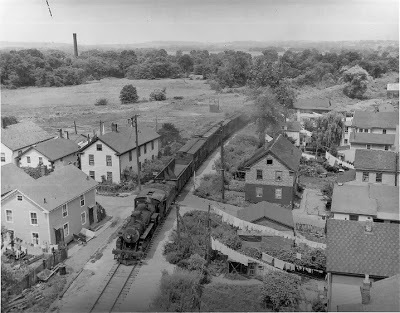 A third line came into Middletown from Berlin (see yesterday's "ghost post"), but by 1947 that line had been cut back to East Berlin to serve some brickyards and a paint factory. 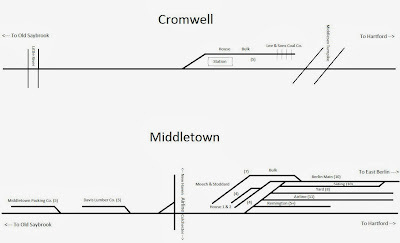 However, the "Berlin line" - or at least its right-of-way - was even more useful as the location of the Middletown yard and the interchange between the Air Line local and the Valley local. 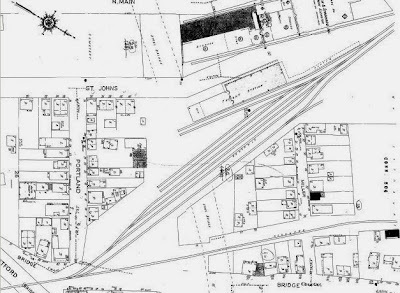 With all the local industries, not to mention the interchange, Middletown was still a busy place in the late 1940s and there was still a lot of track spread out over a fairly large area (at least by CT Valley standards). Consequently, Middletown was where I had to make the most compromises. Cromwell is to the right (north), Berlin branch heads off the north end of the yard, mainline crosses Hartford Ave. on an overpass (lower left). Incidentally, the train in my first "Wordless Wednesday" was southbound at Miller Street, which you see in the lower right area of the map. Industries here include Meech & Stoddard feed & grain (at the top center), bulk track (off that track to the right) and the 2-track freight house (just "down" (east) of Meech & Stoddard). There's even a scale track since carloads of bricks came through here off the Berlin line. Middletown yard was actually two yards - there was another double-ended yard to the north of the one you see above - but I could only fit in one, so I chose to model the "south" yard - the one with the most diverse stuff going on. 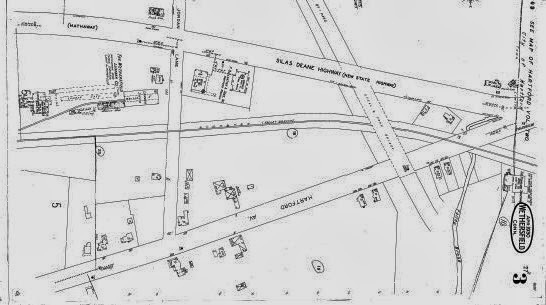 This map is just to the left of the previous map - see Hartford Ave at upper right. This map is from 1924. 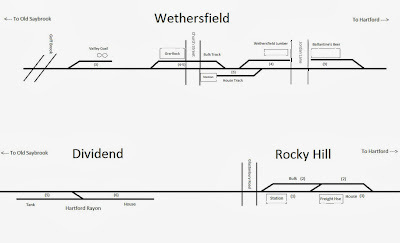 By 1947, the only tracks left are the two mainlines and the quadrant track. The passing & other sidings and all the track down by the river are gone by the end of the 1930s. 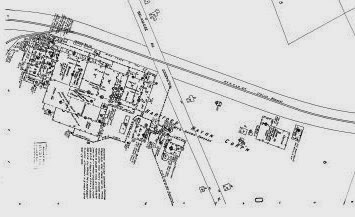 I should have mentioned this earlier, but hopefully it's become apparent by now: all of the Sanborn maps are oriented so the "aisle" (where you'd be standing) is at the bottom. 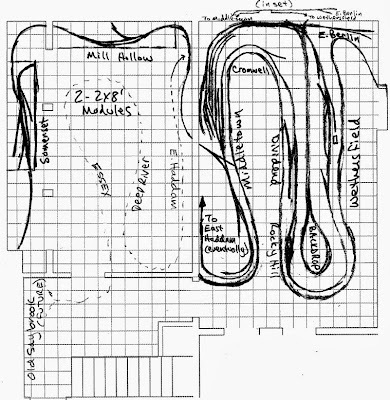 Schematic showing all the modeled track. And here it is IRL (in real life) - Cromwell off to the right, AirLine/Valley diamond & quadrant track to the left. Rightmost cars on Airline interchange track; cars at center of photo are spotted at the freighthouse. Meech & Stoddard will be behind the freighthouse along the wall; bulk track will be "north" (right" of there). This area is, by far, the most compressed area of the whole layout - but I think, given the space I had to work with, it came out pretty well. All the "representative" tracks are included in some fashion and (maybe not so) surprisingly, it operates much like the prototype. I say "much like" since most of the switching/classifying of cars was done by the Valley local in the "north" yard, which I couldn't include. But as long as the Valley local is doing its switching from the "north" end of the yard I do have, it's out of the way when the Air Line local gets in. All in all, it works very well. Davis Lumber is that siding heading "up" ("southwest") off the main. Again, this map is from 1924 - the passing track and the "east" siding are gone by 1947. Diamond at right, Davis Lumber siding further away at center, curve past Middletown Packing in the far distance. Turnback track along wall will be hidden under Middletown and continue under the yard and into the other room to East Haddam. If there's a second-most-compressed area, it's the area from the diamond to Davis Lumber. On the prototype, it's about 1/2-3/4 mile; on my layout, it's about 2 feet. Like Middletown yard, despite the compression, it still operates like the prototype. That's really the point of the compression being selective (i.e. "selective compression," at the risk of being obvious :^). All the main (i.e. operationally critical) prototype elements are included; the fact that they aren't as far apart as on the prototype doesn't matter operationally. Aesthetically, yeah, you don't want to crowd things any more than absolutely necessary. That wouldn't look right. But if it works operationally, then you should be fine. The more space you have to space things out is just gravy. This whole idea of "selective compression" has implications for choosing one's era as well. I hope to flesh this out in a future post, so just a quick example for now. Check out the Sanborn map above and note the long passing siding. That was necessary up to the 1930s to accomodate passenger trains. By WWII, the siding is gone. So, I didn't have to include it in my 1947 version of Middletown. Good thing - that sucker would have eaten up GOBS of space (at least a train length). But in 1947, you don't miss it. In fact, it's more prototypical NOT to have it. 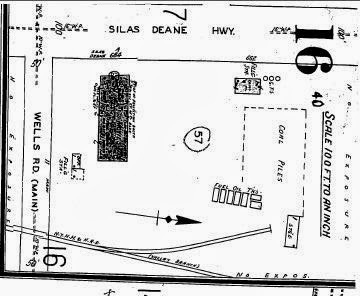 Map from 1924 - first two facing point sidings from right on west (south) side of main gone by 1947. Facing point siding further south on east (north) side of main also gone. Only track remaining in '47 is siding for Middletown Packing itself. The northern-most siding that had been removed by '47 had served a coal dump facility. The siding in the center there (also removed) had curved sharply to the west (south) to serve the side of the buildings there when they had been Middletown Plating Co. All that remained by 1947 was the short siding serving Middletown Packing at the lower left. 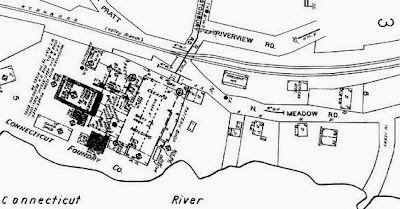 In what's become a theme, especially wrt Middletown, there's a little compression going on here too, and tracks that were there in 1924 (Sanborn map) aren't around in 1947. So, operationally, this area works fine too. However, you may be wondering how these facing point sidings (Davis lumber, Middletown Packing) are served, there being no run-around track. Well, recall that there IS a run-around track, back north in Middletown yard. 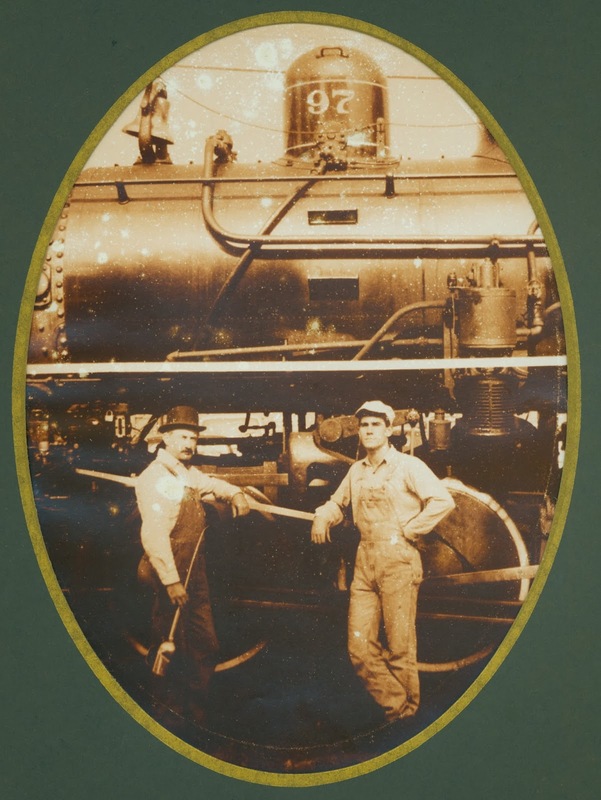 The Valley Local would have to put cars on the locomotive's pilot before serving the industries at the south end of town. Turns out, that's exactly how the real thing operated. How cool is that? Middletown, looking "north" from Middletown Packing back toward the diamond and yard. Mainline south to East Haddam goes along wall and under yard to other room. Wow - if you've read this far, congratulations/condolences! Hopefully I won't have many long posts like this - they're tough on writer and reader alike - but as you can see, even a severely-compressed Middletown uses up a lot of space, in the blogpost as well as in the model(!). As I get to fleshing things out with scenery and buildings, I'll revisit each town in more detail going over what was there - especially industry-wise - and how I'm modeling it. There'll also be prototype photos where possible. Unfortunately, despite my access to some of the most comprehensive Valley Line collections extant, there are still industries and areas for which I have no photos at all (e.g. no photos of Davis lumber; no good photos of Meech & Stoddard, still looking for photos of Wethersfield Lumber and Ballantines). That's where hopefully some of you will come in and rescue me. If you have - or know where I can get - Valley line related pics, please let me know. As I continue this project, those priceless pics will be SO VERY MUCH appreciated! So that's it for the "pure prototype" portion of the model railroad - and that's it for this room. Next up - the "other" room and the (freelanced) Air Line! My answer depends on what kind of ghosts you mean. I don't believe in the creepy un-dead or spirit wanderings of departed souls. But I do believe in the ghosts of the past - the hauntings of a place by the memories of the people who were there. Who were they? Did they have dreams and plans like we do today? While dead people don't haunt us, the spirits and memories of the past can, and often do. Especially if you're paying close attention. Rocky Hill looking south - CT river to the left, freight house at center, station past that in the distance. No buildings yet, but the cars are spotted where the freight house will be. The station will be just beyond. Rocky Hill - North is to the right. Dividend - north to the right. Hartford Rayon main plant to the south of Belamose Ave. Old Billings & Spencer building (used as rayon warehouse in 1947) to the north of Belamose Ave. Switchback not shown on this early map. Dividend, looking southwest. Cars are on the old Billings & Spencer tail track. You can see the switchback in the distance. 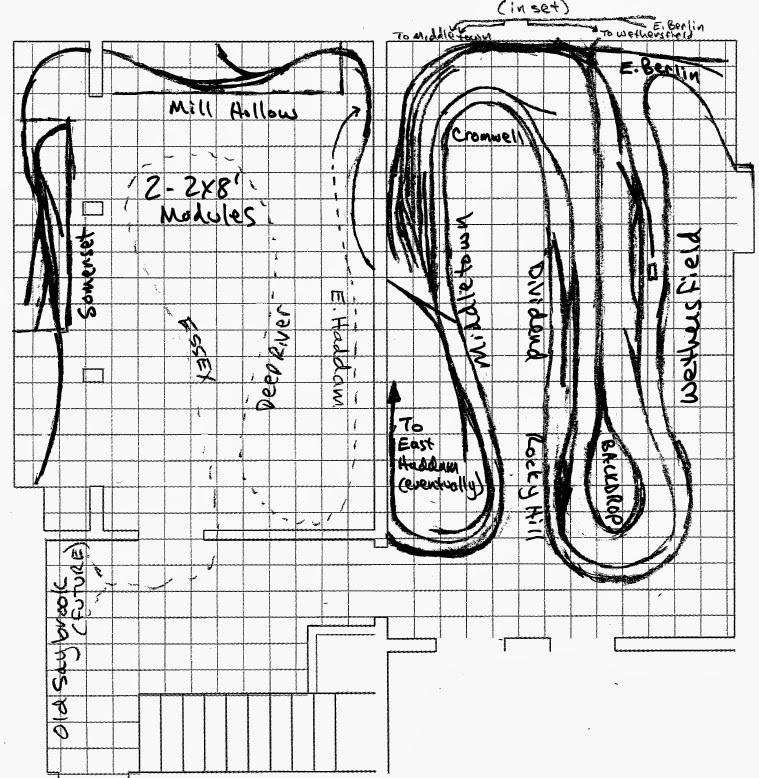 As you can see, if I followed the circa 1924 Sanborn map, my track layout would be all wrong for 1947. John described the switchback operations at Dividend in his Shoreliner article and confirmed this layout when he saw it in person. During WW2, there was a bulk oil distributor further north on the tailtrack. But that business went back to barges after the war. To the left (south) end, you see the "tank" track curving off to the southeast. On the prototype, there was another track there and you can (barely?) see that I have a loose turnout placed there to see if I can fit it in. 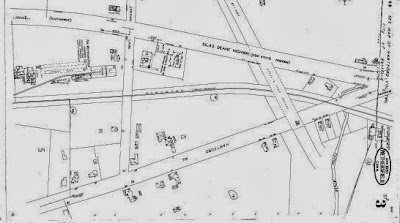 Station in center - note Main Street (aka Middlesex Turnpike). Coal Co. not shown, but would be at end of siding. Great (and lucky) photo mockup of Main Street crossing looking north, and in my era! Siding on the left - station will be between siding and mainline. There's not much to Cromwell - just a siding/house track and Lee & Sons Coal Co. will be at the end of the siding. The coolest thing will be if I can replicate Main Street fairly faithfully based on that great photo - especially the diner with the octagon windows! Lastly (for now anyway), here's another shot of Cromwell showing the siding and the track in the background going through the backdrop. See the "inset" on the trackplan for the track arrangement back there, but suffice it to say that there are two tracks - the closer one is the line from "Hartford" staging (i.e. Middletown) to Wethersfield. The further line next to the wall goes from Middletown to East Berlin (not yet modeled). If you saw yesterday's post on Wethersfield, the train you see here is the same one that was heading "northbound under the Rt. 15 overpass." All in all, I like how the Rocky Hill/Dividend/Cromwell section came out. I didn't have to make any significant compromises, other than compressing the linear run. But even on the prototype, these towns are pretty close together. And, thankfully, the prototype operations are such that you don't end up having too much - or usually any - of the rest of your train in a different town than your loco when you're switching. With the backdrop dividing the scenes so effectively, you still get a real sense of "going somewhere" when you're operating. Given my space limitations, that's pretty much the best I could hope for. Usually for "Modeling Monday" I'll be highlighting particular models I've built, but considering I just posted the trackplan, I figured it'd be fun to show modeling on a "macro" scale. So, for the next few days (so as not to bog down you or your computer with too much at once) I'll be touring the layout as it was as of October 27, 2013. If you want to follow along on the trackplan, we'll be starting in Wethersfield and heading south to Middletown. Then from "New Haven" through Somerset & Mill Hollow to Middletown. Rt. 15 overpass (stand-in mockup) that hides the hole in the backdrop. The train is heading northbound "under" the bridge. Switch to Ballantine's Beer Distributors in the foreground. Overview of north end of Wethersfield. Rt. 15 in the background, reefers on Ballantine's siding, and GN boxcar at Wethersfield lumber, Jordan Lane will run between the ends of the sidings. I don't have ANY photos of either Ballantine's or the lumber co. So if you have - or know where I can get - some, please let me know. Overview of Wethersfield looking south. Wethersfield lumber in right foreground, house track off mainline to left, bulk track and Gra-Rock bottlers beyond (and Valley Coal in far background). Up til the 1930s, there had been a long passing track here. 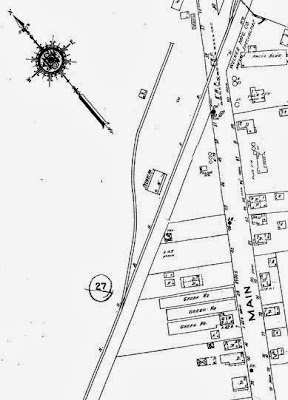 Following the Sanborn map of the area, I included it - then John Wallace informed me that it was gone by 1947. Consequently, I ripped out the passing track and built additional support for the new bulk track. The extra work to make it prototypically/era accurate was worth it. Wethersfield station area: Station to the right & Gra-Rock (stand-in photo mockup) to the left. Church Street runs (will run) between. You can also see one of the "scene setting" photos on the fascia (subject of a previous post). Both buildings still exist. Valley Coal, including office. Wells Rd to the south. Valley Coal, just north of Wells Road. The photo/mockup/stand-in works particularly well here, being almost the right scale (and it's the only known photo of this industry). I'm very glad I was able to model Wethersfield so faithfully. The only major compromise was that I had to fairly severely compress the linear run between Wethersfield Lumber and the station. On the prototype, they're seperated by about a mile, but here the turnouts actually overlap. But that's the art - and challenge - of prototype modeling. Sometimes it's much more impressionist than photorealistic. However, if you do it well, what's missing isn't missed. The ultimate test is when somebody familiar with the area recognizes it as such. My effort here passed John Wallace's scrutiny. He grew up in the area and lives there still. But having such a resource so close can be a double-edged sword. After I "completed" Wethersfield the first time, he noted the passing siding was long gone by 1947. So, to be as accurate as possible, out it came and up went some more benchwork & track (re)arranging. Of course, the other critical test is that the layout owner/artist is satisfied with the result. I have to say, I'm pretty happy with how it came out. Especially after I made the modifications based on John's recollections. That siding (the bulk track) that swings way out from the station, looks just like that in real life. Having that feature replicated on my railroad goes a long way to making Wethersfield as realistic as possible, at least to my eye. The modeled portion of the Valley Line goes from Wethersfield south to Middletown. Eventually, the mainline will continue under Middletown and turn into the other (left) room where it will go through the towns of East Haddam, Deep River, Essex, and - eventually - Old Saybrook. All the track you see (in solid line) is already down and operating; the (very rough) proposed route is shown with a dashed line. I'm pretty happy that all the Valley Line towns I've modeled so far have track arrangements that are identical to the prototype. The only exception is Middletown, which had to have its yard selectively compressed to fit the space I had. 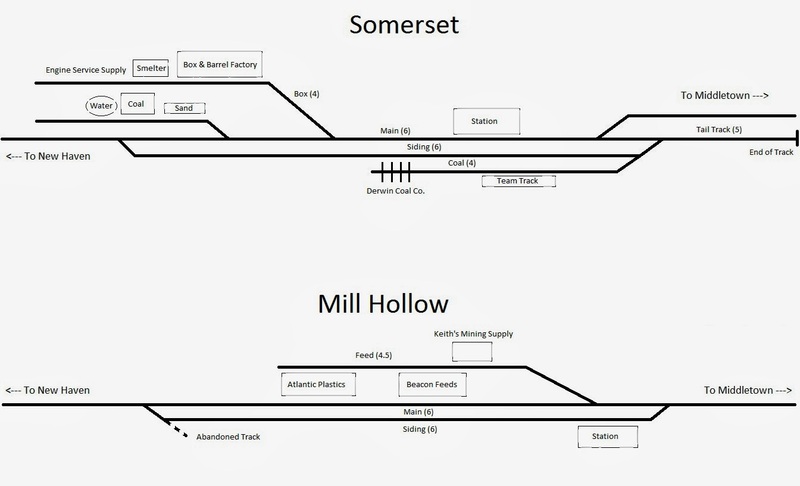 But all Middletown's main elements are there, including the quad track & diamond where the Air Line crosses. Speaking of the "Air Line" (in quotes since it's freelanced so far), it consists of two 2x8' modules that I've connected with a liftout in the corner (in front of the electrical box). I had the modules already, so they're only stand-ins for the Air Line until I get around to modeling it more prototypically. The towns and track arrangements are purely fictional. My primary construction focus now - and for a while will be - the Valley Line. It may be hard to see, but the operating session starts with the Valley Local "offstage in Hartford." In reality, it's sitting in Middletown yard, behind the backdrop and out of view of the operator who is in Wethersfield. He brings the Valley Local "onstage" as it passes through the backdrop and under the Rt. 15 overpass. From there, it's pretty straightforward down to Middletown. Eventually, the Valley Local will continue to East Haddam (in the other room) where it will swap cars with the Shoreline Local which will come up from New London through Old Saybrook and up the Valley line for the swap. 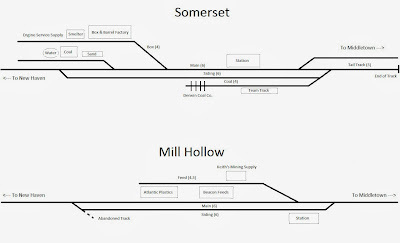 The Air Line local starts in one-track hidden staging to the left off the end of the Somerset module and continues to through Somerset & Mill Hollow to Middletown. So, right now, I only have the Valley & Air Line locals, but will eventually have the Shoreline Local and - if I can work it right (and I think I can) - a few mainline jobs between "New York" and "Boston." But that's fairly far in the future - I'm having a lot of fun operating the two locals I already have! Historic photos provide a window to the past and are among my favorite things, so it's pretty hard to post an old photo and say absolutely nothing about it! I suspect if you're anything like me, you too would like to know at least a little bit about the old photos I post here. I won't always have something to say about a "wordless" Wednesday post, but in this case I'll make an exception. Yesterday's photo was of the Valley Local entering Middletown southbound in May, 1947. It's crossing Miller Street and just about ready to go under the west end of the Arrigoni Bridge. Renowned New Haven Railroad photographer Kent Cochrane took the photo and, like so many of his photos, the original ended up in the collection of his friend TJ McNamara. This copy of the photo came from the collection of Max Miller. The choice for my first "Wordless Wednesday" was easy - this is the first photo I ever remember seeing of The Valley Local and is still my favorite. All my favorite model-genic elements are there: short local freight train, beautiful scenery, local flavor & details (quaint neighborhood, clothes on the line, etc), and - BONUS - shot from a "modeler's" perspective (high up). This photo just screams to be recreated in model form. And that's exactly what I'm trying to do with this project - recreate these wonderful windows to the past. Those two houses are the same two houses seen in yesterday's photo that are closest, on the left. All of the other houses from 1947 are gone - or too obscured by the trees (there are WAY too many trees these days, IMO. But that's a rant for another time :^) But you can still see Miller Street, and while I'm probably 30 or so feet further west, I'm standing on the same bridge Kent Cochrane did over 66 years ago. And that's one of the coolest things about modeling a prototype - especially one from the past. You can have a lot of fun seeing what's still around and trying to recreate what used to be there. If I do it right, one of these days you'll be able to see again what Kent saw all those years ago - even if it's only in HO scale in my basement. They say imitation is the sincerest form of flattery. For some time, I've been following Marty McGuirk's efforts over at http://www.centralvermontrailway.blogspot.com - he's doing for the Central Vermont Rwy. what I hope to do for the New Haven. I always enjoy reading his insights and learning about his process, but some of my favorite posts are his "Wordless Wednesday" posts where he just includes a photo and nothing more. One of the first things you need to consider when modeling a prototype is what era you intend to model. There's been much written about this topic by folks much more knowledgeable than I, but the consensus is that the narrower you define your era, the more plausible your efforts will be. You don't want your steam locomotives pulling Penn Central boxcars, or modern automobiles set in a Victorian scene. Defining your era can also be one of the most enjoyable research projects for your model railroad, especially if you're really into history. Why else would it even occur to you what the proper colors of stop signs and mailboxes were in, say, 1947? The answers to what "normal" folks would probably consider pretty esoteric questions are the puzzle pieces that make up the mosaic of time and place. And the more questions you ask, and the more answers you get, the more effective you'll be at conveying that sense of time and place and the more convincing your "time machine" will be. The "era puzzle" includes many pieces, one of the most important of which - on a model railroad at least - is what type of locomotives you include. There's a reason why the so-called "Transition Era" between steam & diesel power is so popular - you (think you) can have your cake and eat it too and include both types. But the limits of that era can vary pretty widely depending on your prototype. And even when you've picked a prototype that includes what you want locomotive-wise, it may be hard to nail down exactly when those locomotives were last used. That bit of information is essential to defining the outside limit of your era. I definitely wanted to include steam engines on my representation of the New Haven Railroad's CT Valley line, so determining when steam power was last used is an essential piece of the puzzle for me. The Valley line was only a lowly branch of a much larger system, so there'd be no fanfare or documentation of "Steam's Final Run" on the line. I'd have to figure it out myself. Here's the process I went (and am still going) through. Hopefully my experience will inspire you to figure out that part of the puzzle for your own project. . . So we know steam had to end before 4/24/49. What else can we deduce? 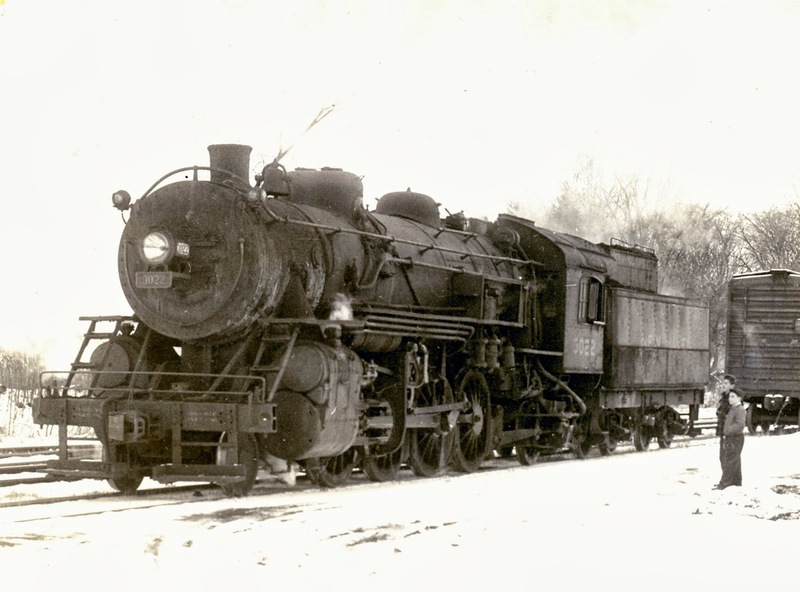 Well, based on photo evidence and the recollections of John Wallace (who "wrote the book" on the Valley Line - well, the articles at least, in the NHRHTA's Shoreliner magazine), we know that the most common engines used were K-1 class moguls on the Valley line and J-1 class mikados on the Airline. 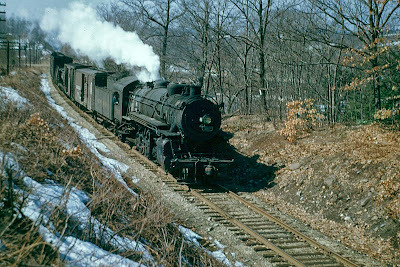 According to John, K-1 #466 was the last mogul in use on the Valley line, supplanted by J-1s before the line was dieselized. He should know - that's him holding down the fireman's box on the 466 below in March of 1948. This shows NHRR J-1 mikado #3011 on the Valley Local derailed at Belamose Avenue in Rocky Hill (Dividend), CT. 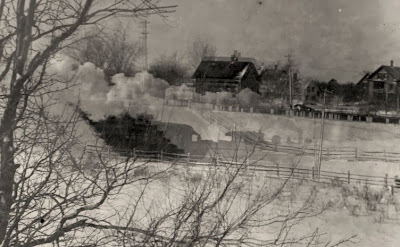 According to John Wallace, who recalls this derailment, it occurred sometime in 1948, but he wasn't sure when. He's also pretty sure that this derailment spelled the end of steam engine service on the line, or was pretty close to it. The snow on the ground says it's winter, but it is unlikely to be winter 1948 since we know K-1 moguls were still being used in March, 1948. It could be as late as winter 1949, but no later since we know diesels were on-line by April '49. You'd think the photographer - especially a photographer as meticulous as John - would know precisely when the photograph was taken. But I just recently found out, even though it's in his collection, John's not the photographer(!). Turns out, he got the photo from the Hartford Courant after he saw it printed in the paper. Every Thursday night, a bunch of us get together to catalog the NHRHTA's Photo Library for Shoreliner authors and other Association publications. One of the guys that comes to help out is a professional researcher - Bob Belletzkie (of Tyler City Station fame.). If the Courant printed the photo in the paper, there would be a date. Using his research skills and digging through the archives, Bob found the article (actually only a photo and caption) and got the date for us: December 21, 1948. So the end of steam on the Valley occurred sometime between December 21, 1948 and April 24, 1949. I may never know the precise date of the last run of steam, but since I plan on modeling Autumn, I now know I can go as late as Autumn 1948. Since I want to use moguls on the Valley local, the latest I can go is Autumn 1947. And that's where I ended up. 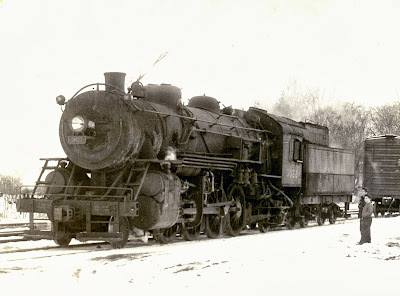 But I'm still curious to know when the last steam ran, so if anybody has any additional information that could narrow that window of time further - most especially an Engine Assignment Book from before 4/24/49 - please let me know. New Haven J-1 #3022 at Canaan, CT. Leroy Beaujon photo. Did the 3022 leave the Airline temporarily and get put on a Canaan-area local before going back? Seems unlikely, and until we get an earlier Engine Assignment book, we may not know for sure. But we can draw a few inferences (assuming the photo captions are accurate). "Winter of 1949" could technically mean anything from December 1948 through February 1949 - or even December 1949. Canaan can get some early snow and it holds on longer, and John's color photo looks very much like late-winter in central Connecticut (notice the melting snow patches). Seeing these two images together, and knowing diesel #0606 would be assigned by April, it looks most likely that John's photo is of one of the last (if not, in fact, the last) runs of steam on the Airline - perhaps January/February 1949. If that's true, then Leroy's shot is probably of the engine after it left the Airline for a new assignment in Canaan, perhaps as early as Jan/Feb '49 but more likely December of that year. In any event, my chosen era of Autumn 1947 is well within the period of time the 3022 was used on the Airline local. If you've read this far, then you likely appreciate the work fun involved in answering the myriad of questions that present themselves when choosing an era and enjoy seeing how all the puzzle pieces fit - once you actually have the pieces in hand, of course. But as fun as the process can be, the better and more efficient we become, the more authentic our efforts will be. So if you have any tips or suggestions of methods you think work better, or what's worked well for you, let us know in the comments below! Given the nature of The Valley Local project, I'll be posting lots of prototype information as my research evolves. But at the end of the day, this is a model railroad, so of course There Will Be Modeling. The only prototype model I have so far specific to The Valley Line is the Wethersfield station. But since I didn't build that myself, I'm loathe to highlight it here. I have built a few prototype cars though, which would have seen service on the Valley Local, so for this first edition of "Modeling Monday," I'll post some pics of those. We'll start from the "end" of the train with a New Haven Railroad "NE" class caboose. While the NE-4 class was more prevalent on local freights in my era, you can't deny the outright charm of the smallest NH caboose of the late steam era. They lasted through the 1950s in wire train and work train service, but in the late 40s could still be seen on the occasional local freight. That's all the excuse I needed to build one myself. The New Haven got these cars before World War I, but rebuilt them in the 1920s & 30s. They were actually the mainstay of the railroad's freight car fleet until new steel boxcars began arriving in the early 1940s. Notice the wood door & wood/steel composite end. Pretty much the same story as the double-sheathed cars, these cars lasted a bit longer in revenue service, but all were converted to work train and tool car service by the mid 1950s. 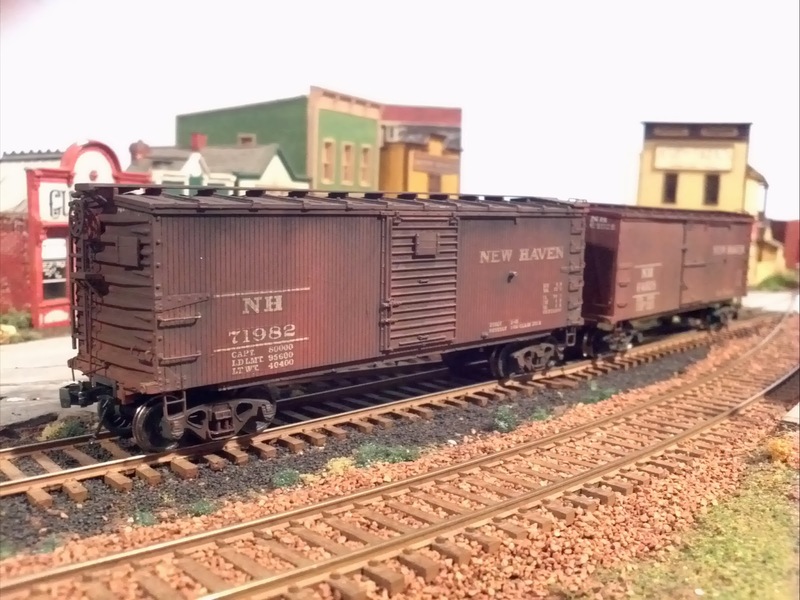 Another NH DS wood boxcar, but this one shows the steel ends & doors applied to many of the cars during rebuilding. I've also shown a little bit of the layout. Actually, this was shot in the freelanced town of "Mill Hollow" on one of the modules that's a stand-in for the Air Line portion of the layout. Since this pic was taken, I've added a photo backdrop. Hopefully my picture-taking skills will improve soon so I can better show you how it looks today. So that's the first edition of "Modeling Monday." In future posts, I'll go into more detail about the prototypes for these cars and how I modeled them. But for now, I hope these pics whet your appetite for what's to come. Before I go any further with this here blog, I thought it'd be a good time to introduce myself to those who don't know me already or know anything about this project. My name is Chris and I've been a history buff for as long as I can remember. It started with dinosaurs and progressed through Civil War & WW2 history. Modeling quickly followed as a way to recreate that history. I never got into gaming, but my room had its share of B17s, P40s and Corsairs. Christmas 1982, I got my first computer and my little brother got a train set. Significantly, my great-grandmother was visiting us and the train set prompted recollections of my great-grandfather's and great-great-grandfather's careers on the railroad. I found this combination of family history and modeling compelling and the computer faded into the background as my dad & I "helped" my kid brother with his train set. Five years later, I deferred college for the chance of a lifetime to work on the real thing as one of the youngest full-time steam locomotive firemen in the country (see pic above). Although I was participating in "living history" at the Valley Railroad, the modeling never really stopped - I was always imagining ways to recreate scenes that had long since disappeared. Model railroading - starting with that old trainset - provided the perfect catalyst. What better way to recapture the past than by recreating an industry that permeated every aspect of everyday life? Of course, all the carpentry, electrical work, and engineering involved in building a layout would be fun - not to mention the research & planning. All pretty intoxicating to a Type A with OCD tendencies! But what would be the focus of such a huge endeavor? I'd first considered modeling the Illinois Central railroad my grandfathers had worked, but I found New England - being right outside my door - much more convenient to research & photograph. A freelanced "New England-y" railroad with 44 tonners & covered bridges is pretty compelling, but once I discovered what railroad ran near my house (the New York New Haven & Hartford), I flirted with different parts of the system: the Naugatuck line (I lived in Shelton, CT at the time), the Berkshire line (my girlfriend - then wife - and I did many roadtrips up Rt. 7), and even - for a brief time - the old Central New England. Once we moved to Old Saybrook, CT - just two doors away from the New Haven's Connecticut Valley Line and within earshot of the steam locomotives I'd fired so many years before - the final choice was obvious. In addition to my personal history with, and - now- proximity to, the CT Valley Line, there are two other reasons to try and recreate this railroad in my basement: John Wallace and Max Miller. 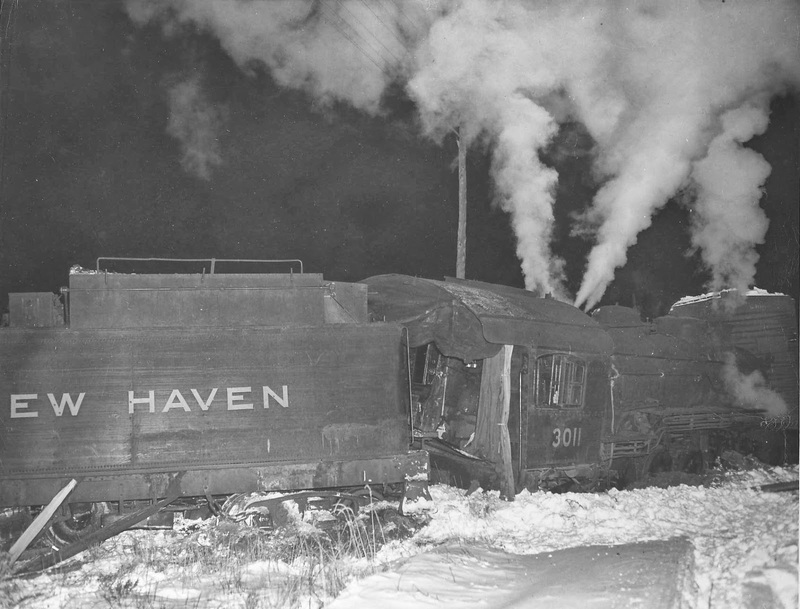 John shared his extensive memories of firing on the Valley Local in a 2 part series in the Shoreliner magazine, produced by the New Haven Railroad Historical & Technical Association (NHRHTA). His vivid memories and great photos would make anybody want to try and recreate the line somehow. I first met Max when I fired on the Valley many years ago, and when we got back in touch shortly after I moved back to the area, I discovered he'd been documenting the line for years. Between these two guys alone, I'd have access to a wealth of material that would help my project - and the fact they come over every week to help with the NHRHTA Photo Library means that suggestions & guidance are never far away. I hope through my efforts here you'll not only get a sense of what life was like in the lower Connecticut River Valley in the late 1940s, but that you'll get to know some of the folks responsible for delivering the "stuff of life" to the area back then and the equipment they used to do their jobs. I see model railroading as much more than "playing with trains" (not that there's anything wrong with that); I see it as a virtual time machine that can take you where ever your imagination leads. My model railroad - if I do it as effectively as I hope to - will take you aboard the Valley Local in the Autumn of 1947. I hope you'll join me. And if you do - Welcome Aboard! It all came down to last night.... All the construction, preparation, and paperwork culminated in a "dress rehearsal" of sorts for operations on the CT Valley Line. Since this was the first time the layout would be operated as designed, I wasn't at all certain that things would go as planned. So I invited a few folks over who had helped with the design & construction (all the better to spread blame for any failures! ), who could provide helpful feedback (since they'd been involved in the evolution of the concept), and who wouldn't give me TOO hard a time if things didn't go well. Fortunately, aside from a few relatively minor issues, things went great! The biggest unknown operationally was how the meet in Middletown yard between the AirLine local (HDX-12) and the Valley Local (HDX-7) would go. They have to hand off cars to one another and HDX-7 has switching to do both in the yard and south of town. 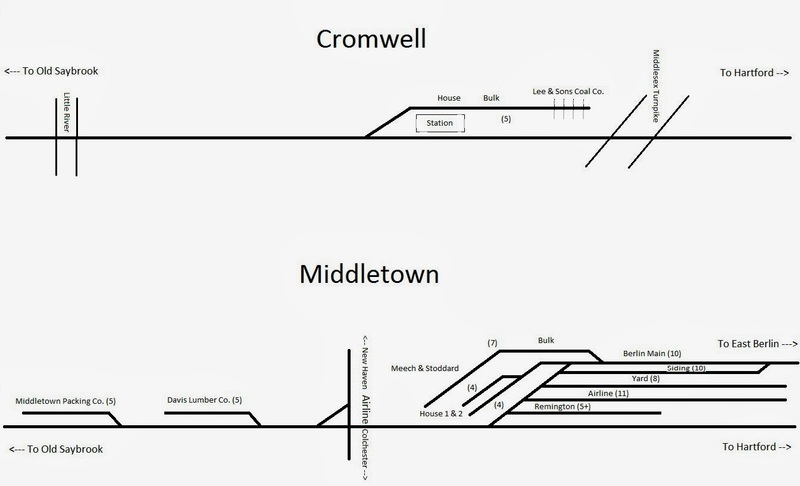 Also, while the rest of the Valley line trackage is almost identical to the prototype, Middletown had to be compressed considerably. I'll get more into the givens & druthers of the track arrangements in a future post, but suffice it to say that the interchange & switching went well despite the shrunken yard. So, all in all, a very successful dress rehearsal. I have the inevitable "punch list" of things I need to do/fix before regular operating sessions start, but it looks like we're good to go!